Author contributions: Saha SK, Saha S, Habib MA, Datta SK and Bock HL were significantly involved in the study conception and design; Saha SK, Saha S, Shakur S and Hanif M contributed in implementing the project and were responsible for acquisition of data; Saha SK, Habib MA, Datta SK and Bock HL were significantly involved in data analysis, interpretation of data, critical revision of the article and the final approval of the manuscript for submission. AIM: To elucidate the age-distribution of anti-hepatitis A virus (HAV) seroprevalence across different socioeconomic status (SES) categories in Bangladesh which, despite scarce data, is generally deemed to have high endemicity. METHODS: Blood samples of 818 subjects from a stratified sample of schools and hospitals, comprising different age categories and SES were collected. They were assayed for total anti-HAV antibodies. Social and medical history data were obtained using a questionnaire. RESULTS: Overall anti-HAV seroprevalence was 69.6%, increasing with age from 1-5 years (40.4%) to > 30 years (98.4%). Seroprevalence was lowest (49.8%) in the high SES group and highest (96.5%) in the rural lower-middle SES group. Among subjects aged 6-20 years, anti-HAV seroprevalence was lowest in urban private school children (43.0%), followed by urban government school children (76.2%) and rural school children (96.5%) (P < 0.01). Within the high SES group, anti-HAV seroprevalence was 32.3% in subjects < 10 years and 51.7% in those aged 11-20 years. Until now Bangladesh has been deemed to have high endemicity for HAV. CONCLUSION: The transition from high to intermediate HAV endemicity may be underway; high SES adolescents and adults remain particularly at risk of symptomatic illness. Preventive measures need consideration. Table 1 Group definition based on age and socioeconomic status classification. NA: Not available; n: Total number of subjects. Figure 1 Overall seropositivity of anti-HAV antibodies by age group (n = 818). n: Total number of subjects with results. Percentage of seropositivity (anti-HAV antibodies) with 95% CI was calculated. The assay cut-off was sample optical density of 1.00. Table 2 Summary of demographic characteristics by socioeconomic status for the age groups 1-5 yr, 21-30 yr, > 30 yr and overall (n = 302). n: Total number of subjects. Figure 2 Percentage of anti-HAV seropositivity assessed by age groups 1-5, 6-10, 11-20, 21-30 and > 30 years and SES (n = 818). 1: n = 81; 2: n = 80; 3: n = 83; 4: n = 83; 5: n = 78; 6: n = 89; 7: n = 89; 8: n = 94; 9: n = 38; 10: n = 39; 11: n = 32; 12: n = 32. Table 3 Summary of demographic characteristics by socioeconomic status for the age groups 6-10 yr, 11-20 yr and overall (n = 516). Hepatitis A virus (HAV) is the most common cause of acute viral hepatitis worldwide. Globally it is responsible for at least 1.4 million new infections each year. Although infection with HAV is often mild and asymptomatic in young children, the disease can be severe in adults. The distribution and prevalence of HAV infection is very closely related to local hygiene and sanitation conditions, and consequently may vary across countries depending on the socioeconomic status (SES) of the population. The highest incidence of hepatitis A infection has previously been reported in developing countries of Africa, Central and South America and South-East Asia[5,6]. In these countries, virtually all children experience asymptomatic infection with hepatitis A before the age of 5 years. As the majority of children in these countries experience early exposure to infection, the symptomatic disease that occurs in a small minority may still pose a significant disease burden[7-9]. Ironically, with improving socioeconomic conditions, these countries are undergoing a transition phase in which the virus is still prevalent in the population but the improving hygiene and socioeconomic conditions delay the average age of infection. From a public health perspective, it is important to identify such epidemiological shifts, because the greater severity of the disease in older age groups can lead to an increased community disease burden. Bangladesh is considered to be a country where hepatitis A infection is hyperendemic with 100% of children ≤ 6 years of age exposed and immune to HAV[3,12]. However, rapid improvements in hygiene and socioeconomic conditions, specifically in sections of the urban population, are taking place. This indicates a possible changing trend of hepatitis A epidemiology in Bangladesh. Neighbouring developing countries, such as India, Pakistan, Sri Lanka and Thailand, have passed, or are currently passing through a similar transition[13-16]. Although there is some data indicating that 90% of the patients admitted with acute hepatitis are school children, there is no data on seroprevalence of HAV in Bangladesh, which may be important in guiding the development of HAV prevention strategies. This prospective, cross-sectional study aimed to determine the seroprevalence of HAV antibodies in a range of age groups, with different SES, living in urban and rural areas of Bangladesh. This hospital and school-based, cross-sectional seroprevalence study was conducted between October 2005 and December 2006 in Bangladesh in a number of sites selected at convenience. Healthy subjects aged > 1 year from different socioeconomic and educational backgrounds were enrolled in the study. To avoid information bias that might have arisen from the use of self-reported family income, we stratified according to age group and SES by choosing study sites where the study was feasible but which varied in terms of type of medical facility, type of school and residential locality, thereby allowing for recruitment of subjects from distinct SES. This methodology of using proxy markers for SES has been used in the past in Bangladesh. In the high SES group, subjects were recruited from the Popular Diagnostic Centre (a more costly private diagnostic centre in Dhaka city) and expensive urban private schools, with high tuition fees. In the lower SES group, subjects were recruited from Dhaka Shishu Hospital, a hospital which provides free treatment. Subjects in the lower-middle SES group were recruited from an urban government school, and subjects in the rural lower-middle SES groups were recruited from rural schools. This additional distinction between urban government and rural schools within the lower-middle SES group was deemed important because water supply and sanitation in rural areas are often not of the same standard as in urban areas. For analysis, enrolled subjects were stratified into five age groups: 1-5 years, 6-10 years, 11-20 years, 21-30 years and > 30 years. Different centres enrolled subjects of different age groups. Subjects between the ages of 1 and 5 years and > 20 years were enrolled from Dhaka Shishu Hospital and the Popular Diagnostic Centre. Subjects between the ages of 6 and 20 years were enrolled from urban private schools, urban government schools and rural schools. The study was conducted according to Good Clinical Practice of the International Council of Harmonization, and conforms to provisions of the Declaration of Helsinki. The research protocol was approved by the Ethical Review Committee of Dhaka Shishu Hospital. Written informed consent was obtained from the subjects or (in the case of minors) from their parents/guardians, prior to conducting any study-specific procedure. Two to three milliliters of blood was collected from each subject enrolled in the study. All the blood samples were assayed for total antibodies against HAV (anti-HAV IgG and IgM) at the Department of Microbiology of Dhaka Shishu Hospital using a commercial anti-HAV microparticle enzyme immunoassay (Abbott Laboratories, Illinois, USA). A sample optical density of 1.000 was considered as the assay cut-off value. All enrolled subjects were medically examined and checked for pre-defined inclusion/exclusion criteria. Subjects were excluded from participating in the study if they were suffering from hepatitis or if they had previously been vaccinated against hepatitis A. Information on age, height, weight, vaccination history, medical history, gender and various socioeconomic factors were collected on case report forms specifically designed for this study. The sample size was computed using nQuery by considering confidence interval (CI) for proportions using normal approximation with 95% CI level. Based on the various expected prevalences (30.0% for the age group 1-5 years, 31.0% for the age group 6-10 years, 64.0% for the age group 11-20 years, 89.0% for the age group 21-30 years and 90.0% for the age group > 30 years) of anti-HAV antibodies with the error margin at 0.1 (10.0%) among different age groups and SES, it was planned to enrol a total of 818 subjects in this study. The estimates considered for computing the sample size were published previously[13,19]. The number of subjects planned for each stratum (combination of SES by age groups) is shown in Table 1. All analyses were performed on subjects whose demographic and serological data were available and who abided with the protocol-defined procedures. Fisher’s exact test was used to compare groups in the anti-HAV results between the SES groups for each age group. The exact 95% CI for the proportions of subjects seropositive for anti-HAV antibodies was used. All statistical analyses were performed using Statistical and Analysis Software version 8.2. A total of 818 subjects were enrolled from different sites. Anti-HAV antibody status was studied in all 818 subjects. There were 161 (19.7%) subjects in the age group 1-5 years (mean: 2.6 ± 1.2 years) from the Popular Diagnostic Centre and Dhaka Shishu Hospital, 244 (29.8%) in the age group 6-10 years (mean: 7.7 ± 1.4 years) from urban private schools, urban government schools and rural schools, 272 (33.3%) subjects in the age group 11-20 years (mean: 13.7 ± 2.3 years) from urban private schools, urban government schools and rural schools, 77 (9.4%) in the age group 21-30 years (mean: 24.0 ± 2.7 years) from the Popular Diagnostic Centre and 64 (7.8%) subjects in the age group > 30 years (mean: 43.0 ± 9.7 years) (Table 1). There were more males than females in the age groups 1-5 years, 21-30 years and > 30 years and more females than males in the age group 11-20 years. The male to female proportions were similar in the 6-10 years age group (Tables 2 and 3). Overall anti-HAV seropositivity was 69.6% (569/818) with the 95% CI (66.28-72.70). Anti-HAV seropositivity increased considerably from lower age groups to older age groups, demonstrating a consistent trend (Figure 1). Anti-HAV seropositivity was highest at 96.5% (166/172) with 95% CI (92.56-98.71) in the rural lower-middle group and lowest at 49.8% (161/323) in the high SES group. Seropositivity for anti-HAV increased with age independently of the SES of subjects. Among the children aged 1-5 years, the seroprevalence was significantly high (50.0%) in the low SES group than in the high (31.0%) SES group (P = 0.016). Similarly, 64.0% and 88.0% of subjects were positive for HAV antibody in the urban lower-middle class group compared to 34.0% and 52.0% in the urban high SES group aged 6-10 years and 11-20 years, respectively. There was also a significant difference in the rate of seropositivity in the urban lower-middle class group (64.0% and 88.0%), compared with 93.0% and 99.0% of the rural population of the same SES in the 6-10 years and 11-20 years age groups (P < 0.01), respectively (Figure 2). In subjects aged between 6-20 years, the anti-HAV seropositivity rates were lowest in the high SES group (49.8%), progressively increasing in the lower-middle group followed by the rural lower-middle group (Figure 2). A statistically significant difference was observed in anti-HAV seropositivity between the high and the rural lower-middle SES groups among both the young (6-10 years) and the adolescent age groups (11-20 years) (P < 0.01). A statistically significant difference in anti-HAV seropositivity was also observed between the urban private school (high SES group) and urban government schools (lower-middle SES group) among the age groups 6-20 years (P < 0.01). 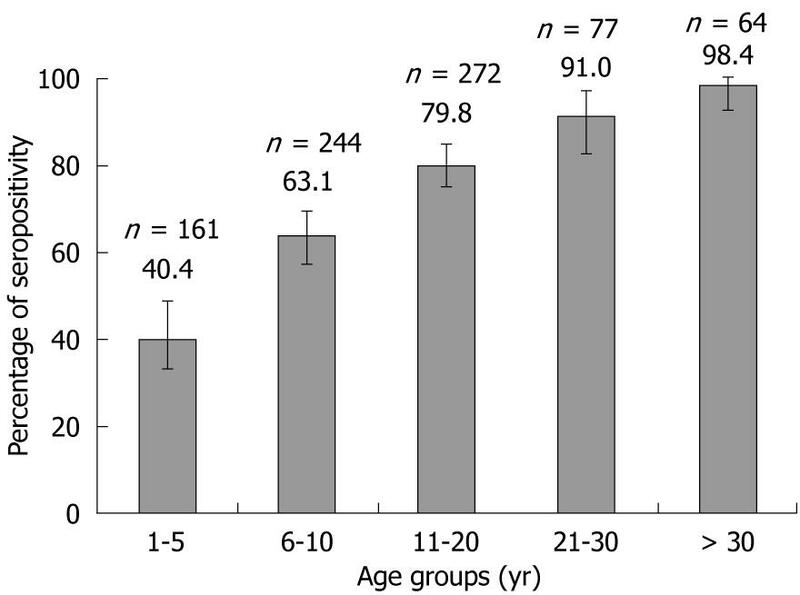 A statistically significant difference in anti-HAV seropositivity was observed between the high and low SES groups for the age groups 1-5 years (P = 0.016) and 21-30 years (Figure 2). Three epidemiological patterns of HAV endemicity are commonly observed worldwide: low, intermediate and high. Each pattern is different with respect to seroprevalence in different age groups, transmission mode and disease burden. Most developing countries have high endemicity, in contrast to the generally low seroprevalence found in the developed world. Furthermore, contrasting endemicity may exist in the same country, based on regional or local differences in SES, water supply and hygiene. This study demonstrated a clear trend in anti-HAV seroconversion with age, where seropositivity progressively increased from 40.4% in the 1-5 years age group to over 98.0% in the > 30 years age group. As expected, there was also an inverse correlation between increased anti-HAV seropositivity and low SES; the exception was the low SES group which had lower seropositivity than the urban and rural lower-middle socioeconomic groups, a finding which can be explained partly by chance and partly by the fact that the majority of the subjects in this group were aged 1-5 years. The very low anti-HAV seroprevalence of about 30.0% observed among children below the age of 10 years in the high SES group is not surprising given that these children have grown up in environments where they are likely to have good access to clean water and sanitation. However, a similar pattern was observed in the low socioeconomic group, where almost half the population in the 1-5 years age group and 36.0% of the population in the 6-10 years age group continued to be susceptible to HAV infections. This finding reflects the effects of improvements in water supply and sanitation that have accompanied economic progress, with benefits for the general population in Bangladesh. This is in marked contrast to previous studies which have shown 100% seropositivity in children aged 6 years or less[3,12]. Amid the very positive improvements in child health that have accompanied economic progress in Bangladesh, nearly 60.0% of children in the 1-5 years age group enrolled in our study and over one third of children aged 6-10 years remain at risk of developing HAV infection, with the risk of symptomatic disease and complications increasing with age. Nevertheless, our study suggests that rural Bangladesh, where the majority of the population resides, can still be considered highly endemic for HAV. In the high SES group (especially in urban areas), anti-HAV seroprevalence remained low among adolescents aged 11-20 years (51.7%) and relatively low (when compared to rates traditionally observed in hyperendemic countries) among adults aged 21-30 years (81.6%). In other words, in the high SES group, one in two adolescents and one in five adults remains at risk of hepatitis A infection. During the transition from high (anti-HAV seroprevalence > 90% by age 5 years) to low endemicity, populations undergo a phase of intermediate endemicity for hepatitis A, when more people are susceptible to HAV infection due to lack of exposure in early childhood and adolescence. Circulating HAV in the community means this group are at risk of symptomatic and potentially clinically severe acute hepatitis[11,19]. Symptomatic disease could lead to significant illness, prolonged debility and is likely to require time off from studies or work during the active and economically productive years of adolescence and early adulthood. Only in the population aged > 30 years did we observe a high anti-HAV seroprevalence rate (98.4%), regardless of SES. This was expected and reflects the cohort effect of a population that was exposed to HAV early in life due to the poor water quality and improper sanitation facilities that would have prevailed during their childhood. A limitation of our design was that the subjects enrolled in the study were from hospital-based and school-based sub-populations. Although not a population-based study, the complete coverage of age and SES made it reasonable to extrapolate these findings to the general population. Our findings that HAV seroprevalence is associated with age and SES are in line with HAV epidemiology documented in developing countries and previously described in the Indian subcontinent. Studies conducted in other countries in the region (India, Pakistan, Thailand, Sri Lanka, Korea, Philippines and Malaysia)[20,21], have likewise shown higher seroprevalence rates in rural populations when compared to urban populations and demonstrated strong evidence of epidemiological shifts, especially in the upper socio-economic groups[14,15,22,23]. The most important mode of hepatitis A control is by improvements in hygiene, sanitation and drinking water supply, which accompany socioeconomic progress. However, the World Health Organization position paper on hepatitis A vaccines states that in countries under the category of intermediate endemicity, childhood vaccination occasionally targeted to specific risk groups may be considered in addition to health education and improved sanitation to contain HAV infections. Effective hepatitis A vaccination programs have helped to control the disease with proven social and economical benefits. Regional experts have also called for wider use of hepatitis A vaccines. Vaccines against hepatitis A have been available since 2001 in the Bangladeshi private market, but are not widely used currently and are not a part of the universal expanded programme of immunization in Bangladesh. In conclusion, although disparities exist in anti-HAV seroprevalence between the upper and lower socio-economic classes in Bangladesh, in conjunction with previous studies we found some evidence of a possible epidemiological transition taking place, especially among the upper classes. In view of these findings and as suggested by regional experts, the introduction of safe and effective vaccination against hepatitis A (with broader coverage), along with improvements in water supply, sanitation and hygienic conditions in Bangladesh may have the potential to reduce and hopefully prevent the severity of future HAV infection in older children and adolescents, with accompanying public health benefits. Hepatitis A virus (HAV) is the most common cause of acute viral hepatitis in children worldwide. Although, HAV infection is often mild and asymptomatic in young children, the disease can be severe in adults. As the distribution and prevalence of HAV infection is closely associated with local hygiene and sanitation conditions, it was important to explore the impact of HAV infection in Bangladesh, which previously was considered hyperendemic. However, rapid improvements in hygiene and socioeconomic conditions, specifically in sections of the urban population have taken place. A research group in Bangladesh has predicted that a probable transition from hyperendemicity to intermediate HAV endemicity may be underway. In the high SES group, particularly adolescents and adults are particularly at a higher risk of acquiring symptomatic illness, indicating the need for immunization against HAV, especially in this high risk group. Bangladesh is considered to be hyperendemic for HAV. However, rapid improvements in hygiene and socioeconomic conditions, specifically in sections of the urban population, are taking place. This indicates a possible changing trend of hepatitis A epidemiology in Bangladesh as has previously been observed in neighbouring countries, such as India, Pakistan, Sri Lanka and Thailand. During this transition from high to low endemicity, populations undergo a phase of intermediate endemicity for hepatitis A when more people are susceptible to HAV infection due to lack of exposure in early childhood and adolescence, despite circulating HAV in the community, and are consequently at risk of symptomatic and potentially clinically severe acute hepatitis. Prior to this study, no data were available on the seroprevalence of HAV in Bangladesh in different age groups and social classes, which are important parameters that guide the development of local HAV prevention strategies. This is the first study to assess the entire population spectrum of Bangladesh for hepatitis A seroprevalence. The study demonstrates that a possible epidemiological transition is in progress among those of high socioeconomic status (SES). However, more than half of children aged < 10 years and almost half of individuals aged 11-20 years were still at higher risk of symptomatic hepatitis. Surprisingly, there are also some indications that an early epidemiological transition may be occurring in the lower SES groups. The study results may help decision making on public health policies and vaccination strategies for the control of hepatitis A in Bangladesh. HAV, HAV seroprevalence, anti-HAV antibodies, Socioeconomic groups, Age groups. The authors described an epidemiological study investigating the anti-HAV seroprevalence of 818 subjects from hospital- and school-based subpopulations in Bangladesh, and found that anti-HAV seroprevalence was correlated with increasing age and inversely correlated with higher SES. They concluded that vaccination against hepatitis A should be considered to reduce the future burden of symptomatic HAV infection in this country. There are few reports on the seroprevalence of anti-HAV in Bangladesh where hepatitis A infection is hyperendemic and hence, this manuscript is worthy of publication.